July 10, 2016 will be the important day in the history of cryptocurrency. A number of events and trends are converging towards this day or the time period immediately surrounding it. For the first time in seven years, by August we may finally have clarity on bitcoin's future and whether it is going to succeed or fail in the long term. On that date, bitcoin's block reward is projected to fall by half. In the near future, OpenBazaar expects to have a functional release that, if successful, will significantly increase traffic on the bitcoin network. Meanwhile, blocks are filled to capacity and the network is already unreliable. Finally, Ethereum succeeded in its Homestead release, adding new features to the network in what its development team now calls usuable for non-test applications. When the information is presented visually, the ridiculousness of the current situation becomes clear. Note that others have also supported Andresen's proposals, so he is not solely responsible for this trend. 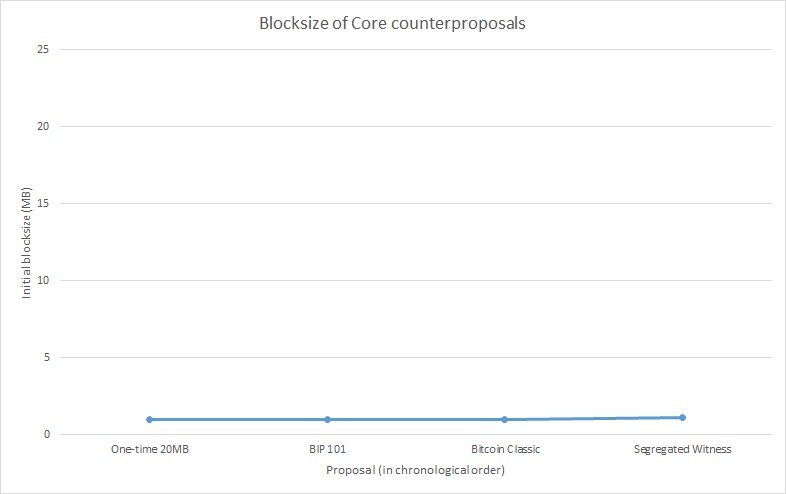 On the first chart, we can see how Andresen's first proposal in early 2015 suggested increasing the size of bitcoin blocks to 20MB. He then lowered his target to 8MB, with blocks not reaching 20MB for about 3 years. Later, he released Bitcoin Classic, which lowered the bar four times more to 2MB. He also said he will support the new idea that is all the rage, Segregated Witness, which is likely to provide a 10% capacity increase. As you can see, the Core's blocksize proposals have increased by 10% over the course of a year, while Andresen is willing to reduce his target 19 times lower than it was initially. While the Core is primarily responsible for destroying bitcoin through its shortsightedness, the fault for the options available now lies squarely on Andresen, who has given up so much ground that even if the Core agreed to the latest proposals, it will take years to prepare the network for an upgrade to a solution that is already obsolete. Let's suppose, however, that Segregated Witness does get finished quickly and that both sides can agree to roll it out before July. Some people have suggested that Segregated Witness will allow for 1.3x or even 2x as many transactions in bitcoin blocks as there are now, but that is unlikely for a number of reasons that are out of the scope of this article. Segregated Witness is a voluntary upgrade, where people would theoretically be incentivized to support the rollout by using special types of transactions that cost less. Since it is voluntary, it only reduces bandwidth if people actually use it. 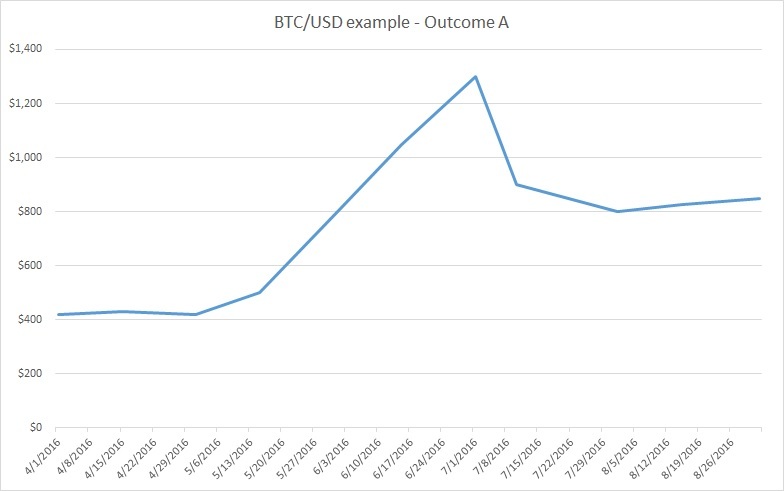 This chart describes the case of an exchange like Yobit or Blutrade. It is also very optimistic about the savings provided by Segregated Witness for the types of transactions an exchange processes. Notice that even in this extremely optimistic scenario where 2x savings is achieved, it takes 2.74 years(!) for the work involved in implementing Segregated Witness into a high-risk production system pays for itself. Systems that handle tens of thousands of dollars cannot simply be changed on a whim (or they end up like Mt. Gox, where everyone made changes directly to production). There are procedures and laws, like Sarbanes-Oxley, that strictly regulate code that goes into accounting systems. We need to include the expected value of a catastrophe arising from this change - say a 1% chance of a $200,000 loss. Most investors want to see some sort of progress or returns before that many years pass, so it is difficult to see what kind of business would decide to take on this upgrade. Even if they were on a five-year plan, technology is now increasing so exponentially that it is impossible to predict what the world will look like in even two years - so something better than Segregated Witness may necessitate another upgrade that never allows the investment to be repaid. The previous charts have hopefully convinced you that Segregated Witness is not a realistic solution to the blocksize problem. 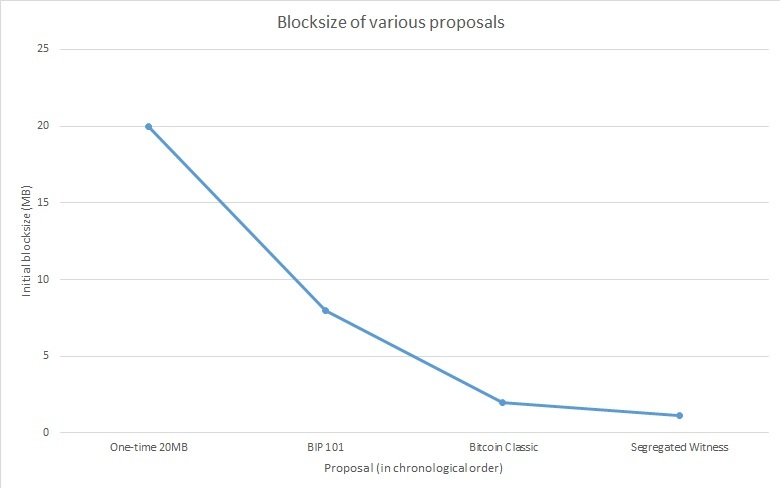 Furthermore, the supporters of increased blocksizes have negotiated so poorly that when the crisis hits, the solutions on the table is no longer something (like 20MB or 8MB blocks) that would give bitcoin enough time to recover. Given that it was always clear that the Core was unwilling to compromise, they should have held to the larger blocksize and waited for the crisis to occur that would necessitate it. 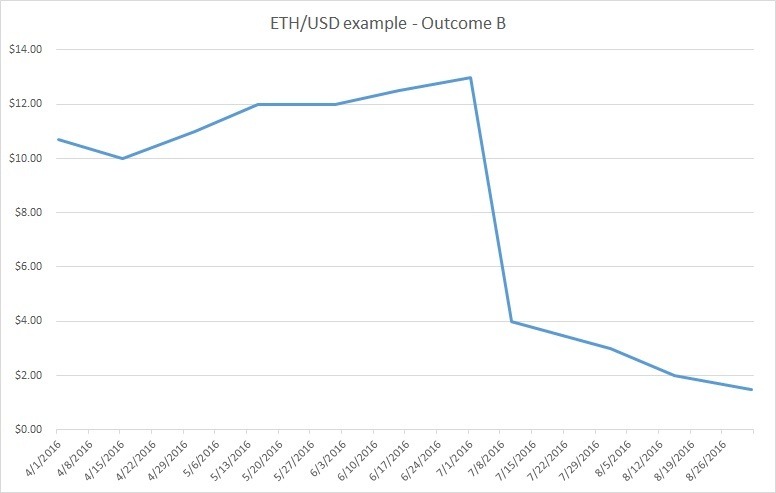 When Andresen withdrew BIP 101 from consideration, he significantly increased the risk of failure when the crisis point occurs in July. After these considerations, I came up with three scenarios that could play out as July 10 approaches. My base assumption, in which I am very confident, is that Ethereum is here to stay. 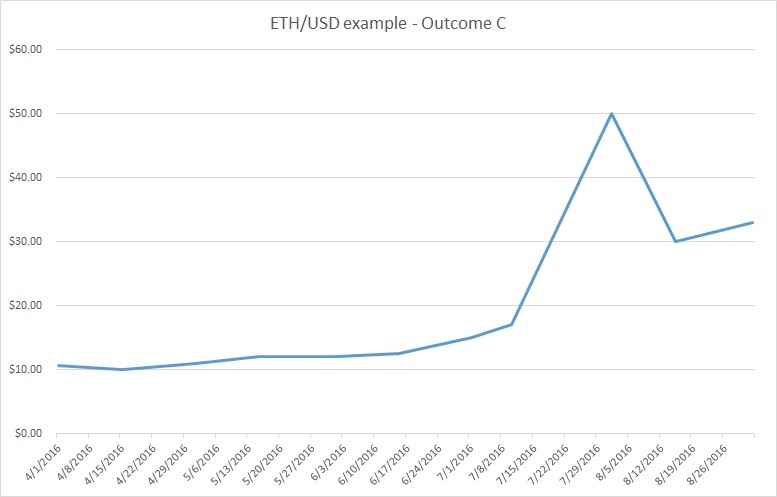 I think that the Ethereum network's increase in value and the attention given to it as a result has led to many people, including myself, researching its fundamentals and recognizing that it is technically superior to bitcoin (but lacks the network effect). To see why, consider that if both Ethereum and Bitcoin were starting from zero right now, it's difficult to see how Bitcoin would become the preferred coin. If you disagree that Ethereum has solved most of Bitcoin's problems and adds additional features, I suggest reading some of the excellent reference material that exists on Ethereum, as I've already discussed the pros and cons of Ethereum in other posts. 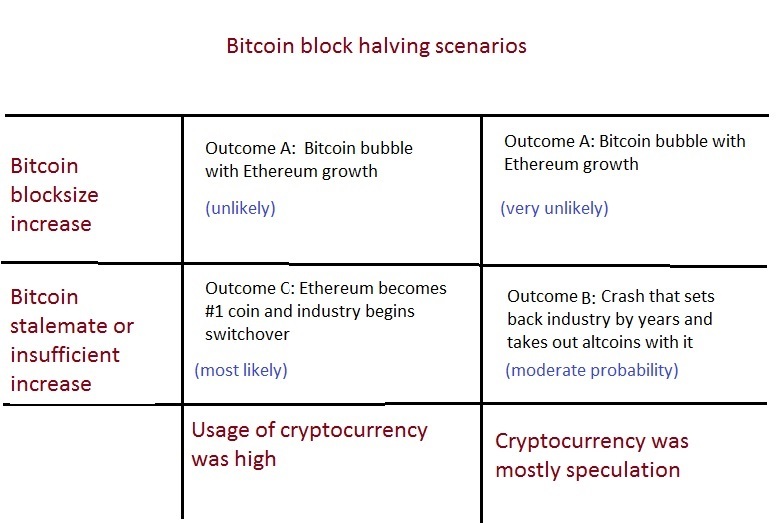 The two independent factors are whether the bitcoin blocksize increases before the halving, and whether cryptocurrency is being used at this time mostly for speculation. As you can see, two of these blocks result in the same outcome. I believe that it is likely that bitcoin is now being used for more than speculation, and that there is not enough time to deploy a blocksize increase even if consensus were reached before the halving. In this scenario, the bitcoin blocksize is increased, and it doesn't matter whether cryptocurrency turns out to be used for speculation or merchant activities. It's difficult to imagine a situation where the announcement of a real, permanent solution to the blocksize before the halving results in any other outcome than a significant bitcoin price increase. The price increase would then allow miners to continue mining without a reduction in hashrate. This outcome could play out if there is a surprise agreement by the Core that they will agree to a permanent solution, like the Bitpay solution that is being talked about lately, or if they for some reason changed their mind about BIP 101. We would see bitcoins become very valuable, and then settle at a much higher level with continued growth afterward. The critical issue here is that a permanent solution would unlock the ability for investors and businesses to enter the space. Any smart businessperson who is considering investing now is likely sitting on the sidelines waiting to see how the debate plays out. I don't see this scenario as likely because it is solely determined by whether the bitcoin blocksize is increased, and there is little reason to suspect that progress will suddenly be made in three months after a year of brutal debate. This outcome relies on two assumptions: that the bitcoin blocksize debate will be unable to be resolved (likely), and that cryptocurrency is used mostly for speculation (unknown, but I guess unlikely). If cryptocurrecy has no real transaction volume and it remains just a playground for speculators, then the outcome is likely to be ugly. Remember that price must increase to $850 for miners to continue to earn the same profits after the reward halving. Even if price increases to $500 before then, a significant portion of the network hashrate will shut down the day that profits decline. The result will be that every block will be full as there are fewer blocks. To compound matters, the time until this situation corrects itself is likely to be very long. If hashpower cuts in half, then the network will be unusable for a month. If hashpower declines by 33%, it will unusable for three weeks. The unusuability of the network complicates matters, though, because if people cannot get transactions through to exchanges, the price of bitcoin is likely to crash as panic ensues. After the panic ends, price is likely to remain low enough that yet more unprofitable miners go offline, extending the time period that the network remains unusable. In fact, if price stabilizes at $100 after the crash, then the mining rewards will actually be 1/8 (!) what they are now. This catastropic event would require as long as four months before the network would re-adjust its difficulty. If people are simply putting money into cryptocurrency to speculate, altcoins would also suffer considerably in the general panic and their value would be destroyed just as unrelated stocks get destroyed in market panics. The industry would be set back by years as a string of businesses fail and investment dries up even more than it has now. After everything is over, a completely new coin that has solved the parameter-setting problem will emerge, perhaps using artificial intelligence to solve the consensus problem. In the interim, bitcoin would retain some value because of its usage for illegal activities. I think this outcome is more likely than the outcome of the blocksize debate being resolved, but as it requires that cryptocurrency be almost entirely supported by speculation, I think the causative factor isn't present. Speculation dominated bitcoin years ago, but more uses have emerged recently. 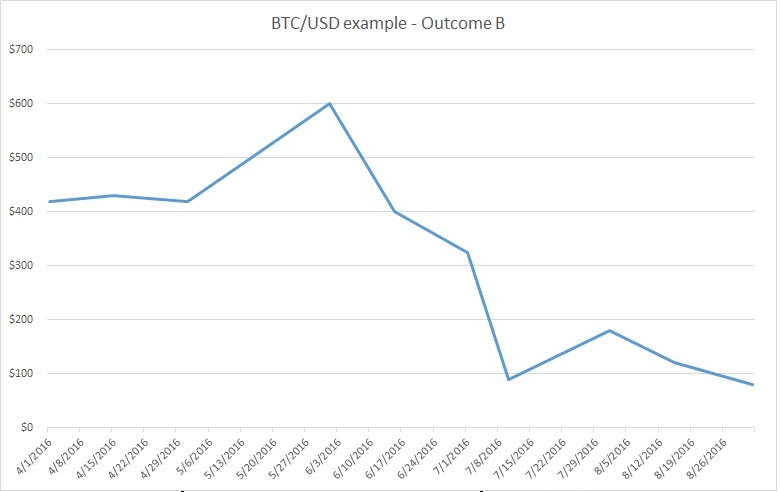 In this outcome, bitcoin falls into the panic scenario described in outcome B. However, because people need to use cryptocurrency (and it isn't just speculation), they look for an alternative instead of simply selling out. The obvious alternative is Ethereum, which does not have a blocksize problem, has committed developers, and is being supported by more and more businesses. Ethereum does have weaknesses, but the main weakness (lack of API compatibility to enable an easy changeover) could be solved by a major exchange like Coinbase suddenly releasing software that they used for their own systems. 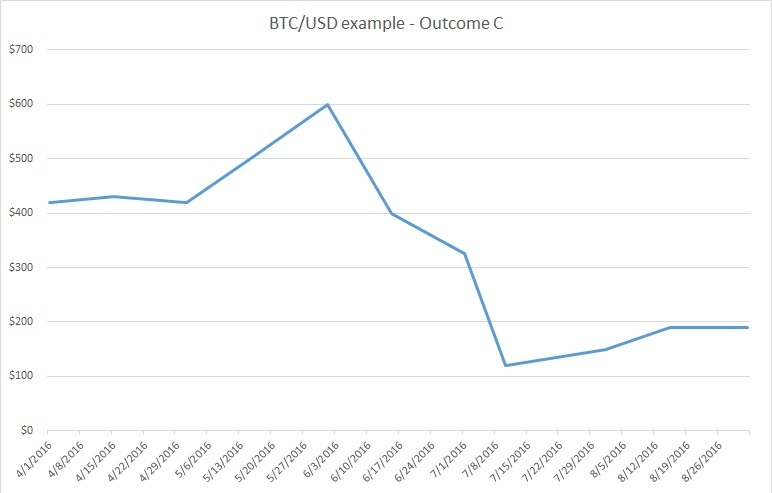 In this outcome, we would not expect to see bitcoin's value go to zero, because there will still be demand for it. Instead, the panic will set bitcoin back just enough for Ethereum to surpass it. After that, continued infighting between remaining bitcoin users will suppress bitcoin while Ethereum would take off at a much faster rate. The Core developers would probably eventually release the Lightning Network, but that network will already be obsolete because Ethereum has no need for a Lightning Network (and could far more easily implement it in contracts if it did). For those confused at how these charts indicate Ethereum being more valuable than Bitcoin, there are more than 4x as many ether as bitcoins, so a price on July 10 of Bitcoin $150, Ether $35 is sufficient to make Ethereum the #1 coin. Given that Ethereum has hovered around $11-13 recently, the growth required of Ethereum is less than 3x to surpass bitcoin in this new world where the total market capitalization of all cryptocurrencies has been diminished. The value of Ethereum may then decline below bitcoin market capitalization before it surpasses it again. As a reminder, Litecoin was worth $50 at a time when it had three times as many coins available as bitcoin did, and Auroracoin has risen to close to $100. I was surprised when I examined all the possibilities and came up with this outcome being the most likely. But when I reexamined my assumptions, I wasn't able to come up with a reason that this shouldn't happen. The most obvious objection is that people would settle on an altcoin other than Ethereum. But which coin would that be? DASH's anonymity is not business-friendly. NXT is just as complex as Ethereum but has fewer capabilities. Litecoin would be an obvious choice, but we presented litecoin with a solution to the blocksize problem and they didn't adopt it or any alternative. Dogecoin could be the alternative, but it is not supported by big companies. Other than litecoin, none of these coins have widespread support on the major non-altcoin exchanges. And if you still think Ethereum is a scam or isn't well-known, look at http://www.nytimes.com/2016/03/28/busin ... coins.html. Amanda of the Daily Decrypt (http://thedailydecrypt.com) made a great point in her "Ask Me Anything" yesterday that is worth repeating: among all the hundreds of coins, which makes the fewest improvements while wasting the most resources? From now on, I'll term this the "conferences vs. code" argument: Bitcoin developers spend a significant portion of their time traveling to and attending conferences, while developers of most other coins spend their days at home writing code. Which of the two activities is likely to result in the greatest benefit? There isn't much that needs to be said about that chart. When we started this pool, the percentage of people who wanted to be paid in bitcoin was 90%. A number of factors are converging around the time of the block halving that are going to lead to the most important point in the history of cryptocurrency. For the first time, it has become reasonable to project that Ethereum will overtake bitcoin in July as the bitcoin network becomes unusable. The Core developers, theymos, and those who support them are failing to see the big picture - while the Lightning Network and their other improvements could be the best ideas possible, they have simply run out of time. The bitcoin community is largely unaware of the enormous growth happening with Ethereum because posts about altcoins are censored (like in /r/bitcoin or /r/bitcoinmarkets) or, where they are allowed, downvoted. People who blindly assume that bitcoin is assured the #1 position solely because of its network effects may be surprised by the speed at which this event may occur. It is a shame that a promising industry has been put in such a position. While what you illustrate and hypothize makes sense. I see one major problem. Eth has plans to go strictly to PoS which has never proven as a viable replacement to PoW. In fact, maintaining a centralized control of PoS is far easier to do then a PoW network. All one has to do is own more than 50% of the supply and its game over. Thats significantly easier than owning 50% or more of a PoW network. Eth is nothing more than a super hyped & marketed coin atm, hell its wallet barely works and the mining software is a joke, no normal user is gonna wanna use it ....ever. As a result, if Ethereum does indeed end up becoming the top dog. I will consider this experiment a failure and move on from crypto most likely. 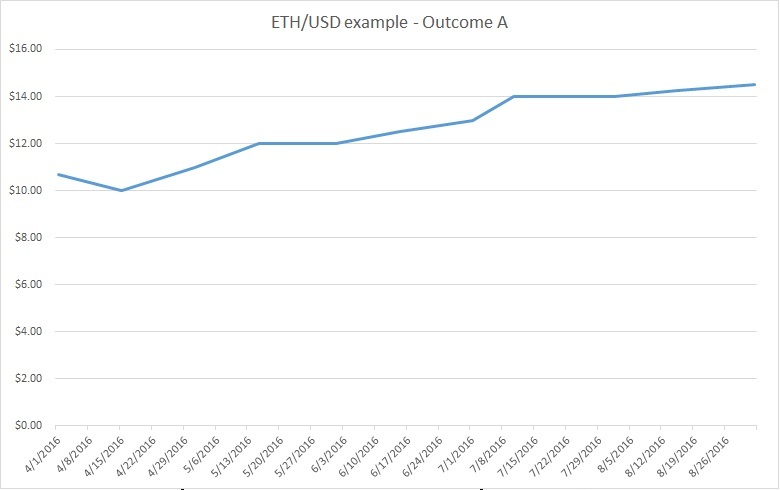 So far ETHUSD Options A, B and C are not aligning with actuals. Take note people. You can't predicte something that is truly market driven. If Govt or Big Org controls, then the story may be different. Hopefully, Bitcoin, Ethereum, Ripple, etc. will stay truly market driven, and future may not be predictable, but it will be interesting. What is your estimated share of Cryptocurrency volume used for real application vs speculation as of April 2016?